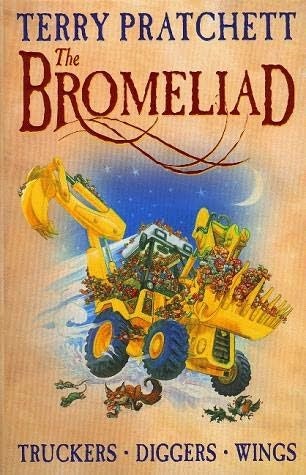 The title of this post is a lie: I don't actually want to review Pratchett's The Bromeliad Trilogy (also known as The Nome Trilogy), but rather to gush over how great it is and to tell you all how it blew my mind when I was about 10. I love this series the absurdly protective way reserved for childhood classics and I credit it with a big part of my interest in social change and activism. (I also spend a lot of energy aggressively trying to get all my friends to read it; and I would like to take the opportunity to ask you all to join the campaign for Claudia's education NOW). The Nome Trilogy consists, unsurprisingly, of three books (Truckers, Diggers, Wings), and is, also unsurprisingly, about Nomes. Nomes are tiny people, about 10 cm high, who live on Earth unnoticed by humans. In Truckers, a group of outdoor Nomes, lead by Masklin and Grimma, find their way to Arnold Bros. (est 1905), a department store. There they meet the inside Nomes, who have lived under the floors of the store for generations and who don't react well to the unfamiliar (most inside Nomes hold the religious belief that ‘The Store’ contains 'All Things Under One Roof', and so there can be no “outside”, while the more scientifically inclined have devised the theory that outside Nomes would have pointy heads, as this shape is more fit for unpredictable weather). The outside Nomes have owned, since times immemorial, The Thing, a mostly useless metal cube. In the presence of the electricity in the store, The Thing powers up, revealing that it's the board computer of the ship that brought the Nomes to Earth, long ago. When they learn that the store is about to be demolished, the Nomes have to work together, navigating religious systems and social norms, as well as personal antipathies. They manage to escape the store in a truck, and find a new home at an abandoned quarry. In Diggers, the Nomes have more or less adjusted to life in The Quarry, but they are continuously threatened by human presence. A religious sign prompts Masklin, Gurder (a religious leader), and Angalo (a prodigy engineer) to leave the quarry, going out to the investigate a nearby airport, taking the Thing with them. In their absence, those left behind have to deal with a new threat: the quarry is to be reopened. Grimma leads the defense efforts, sabotaging equipment, locking up the quarry, and even attempting to communicate with humans. In the end, the Nomes are driven out again, escaping on an excavator. Wings is the story of Masklin's, Gurder's and Angalo's journey. The Thing convinces them that they should take it to a satellite launch, where it can attempt to contact the ship. The Nomes end up in Florida, where they meet other tribes of Nomes and realize there must be more to the Nomanity than they thought. Humans also have to deal with the existence of Nomes, as their spaceship lands. The Nomes use the ship to save the ones that are escaping the quarry, then leave Earth. But they know they must return, for all the other Nomes, as well as for humans, who might be capable of intelligent communication. The title of the series comes from bromeliads, a type of tropical plant with big flowers. The rainwater pools that form in the central cup of the flowers are home to some species of frogs, who live their entire lives there, unaware that there's more to the world. Grimma learns this fact in a book, and uses it as a metaphor when refusing Masklin's offer to “settle down” with him, in Diggers. The metaphor is then picked up by the narrator as a parallel for living under floors and space exploration. (Ok, that's not how bromeliads actually work, they don't have a closed flower, and the poison-arrow frogs only spend the first part of their lives between the petals, but let's just go with it). By the time I read this trilogy, I had read a bunch of children's books and a few grown-up ones. I was familiar from grown-up books with the idea that sometimes in stories you don't have a clear-cut villain, but a diffuse conflict. And that's the case with TBT. Humans don't actively want to hurt the nomes, they just sort of don't notice them. The abbot doesn't set out to hurt Grimma by preventing her to read (because her womanly brain may not be able to take it), he and the others are enforcing the norms they have inherited. And it's perfectly clear that Grimma wants to read, that the Nomes want to live, and that these are legitimate desires. The tension is ingrained in the structure of the world and arises from the conflict between the institutions and the individuals. This wasn't entirely novel to me as a conflict. What was novel was the fact that the characters unequivocally triumph over the structures: the narrative rewards Grimma's curiosity about the world with a SPACESHIP. Exposed to new religions and lifestyles, Gurder, the fervent worshiper and religious authority of the Nomanity, neither doubles-down nor disintegrates in despair, but becomes an agnostic humanist (nomeist if you will) and sets out to do community building work. Dorcas gets to tinker away with Jekub and his enthusiasm for improving Nomes' lives with technology does actually improve nomes' lives. I knew, as a kid, that there are stupid, wrong things in the world that are nevertheless respected; that people argue over religious dogma, that there were things girls weren't allowed to do, and that in different parts of the world the rules were different but just as arbitrary. But I was pretty floored by the idea that stupid wrong things can be changed. And especially by the idea that the process of change can make such a compelling story. Terry Pratchett's children's writing is some of his best work.